Support groups are an informal resource that attempts to provide healing components to a variety of problems and challenges. An informal support outside of family, friends, or professionals often provides greater understanding, more similarity (from individuals experiencing similar life events), an opportunity for empathy and altruism, and a sense of identity for participants. Learning new ways to handle challenges, cope with changes, and maintain new behaviors are all important aspects of the support group experience. A characteristic unique to support groups is the mutual support members are able to provide one another. This support and validation from other group members help facilitate personal growth and change in a way that individual therapy cannot. Although experts and professionals can provide support and positive direction, the mutual exchange of information between group members is a powerful experience that often induces lasting change. Most support groups are facilitated or led by lay persons, often in conjunction with existing organizations (such as NAMI, the National Alliance for the Mentally Ill, or AA, Alcoholics Anonymous). Support groups usually have a set meeting time (generally weekly or monthly), and an open format. Open format means that the groups are ongoing, and members have the option of attending when it is convenient for them. This is in contrast to other types of structured treatment or psycho-educational groups that may meet for a certain number of sessions, with the expectation that participants attend every meeting. The open format allows members to feel some degree of anonymity, and to participate as they are comfortable. For some people, simply attending meetings and listening to the experiences of others can be helpful. The healing power of groups is well documented, and support groups offer many of the same therapeutic characteristics as more structured groups. These factors include: altruism (chance to help others), belongingness, universality (there are others who struggle with similar challenges), interpersonal learning, guidance, catharsis, identification, self-understanding, instillation of hope, and existential factors (such as the search for larger meaning in life). Each of these factors is directly related to the mutual support that members provide one another. 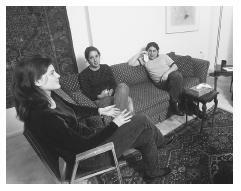 Support groups are generally less structured than psycho-educational groups or therapy groups; however, each group usually sets its own norms, rules, and schedules. Some groups, such as AA, traditionally reserve time for individual members to discuss their own challenges and progress in front of the group. Others bring in speakers periodically to provide information about disorders or specific coping skills. However, the strength of support groups lies in its members, and their willingness to share their own experiences, challenges, and solutions in the context of the group. In addition to these traditional, face-to-face support groups, technology has had an impact on the functioning and availability of support groups. There are many list-serves, e-mail groups, and chat groups that provide information about specific life problems (adoption of children outside the United States, for example), certain types of mental illness, and specific health problems. While there is always the risk of communicating with others who are not honest, many people benefit from these Internet interactions. Some individuals are actually more comfortable participating in Internet support groups due to the greater anonymity they offer. There are a variety of problems and challenges that are addressed in support groups. Generally speaking, the severity of the symptom, as well as the phase of the illness or disorder, will determine whether participation in a support group is appropriate. For more severe types of mental illness, such as schizophrenia , or depression with psychotic episodes, a support group is probably not the optimal intervention , particularly at initial onset. After stabilization through therapy and medication (as appropriate), a support group may offer an important addition to more formal treatment. In these cases, the socialization, interpersonal relationships, and social support that can be gained through the group may not be available elsewhere, and as such, it can be a very positive experience for the participant. In a group situation, a participant can learn how to express feelings in a healthy and positive way, practice assertive communication, receive feedback about appropriate and inappropriate content for conversation, receive feedback about nonverbal communication, learn new ways to ask for help from others, be able to help others, learn how to form friendships, and learn new coping skills and behaviors. Various types of support groups exist. Some groups provide support for very specific types of loss, illness, or life adjustment. A representative sample is listed below. BEREAVEMENT/GRIEF COUNSELING GROUPS. Bereavement and grief counseling groups provide support to people who have experienced a loss. There are groups for people who have lost a spouse or partner, parents, children, or pets. There are specific groups for people who have lost a loved one due to homicide, suicide , SIDS, cancer, or miscarriage. These groups help individuals adjust to the death of a family member or friend, learn how to accept the loss, honor the memory of their loved one, and adjust to life after the loss. MEDICAL SUPPORT GROUPS. Medical support groups may be more short-term than other types of support groups, depending on the specific disorder. Some groups are formed to help patients adjust to specific treatments, such as chemotherapy or radiation, while others focus on longer-term adjustment and recovery issues, such as a breast cancer support group. These groups may have a stronger educational component to help members understand physical changes they may be experiencing as a result of their medical procedures. WEIGHT LOSS GROUPS. Although these groups are very specific in their focus, their individual structures can vary greatly. Some weight loss support groups are actively involved in the process of losing weight, and may include monitoring of diet and exercise, while others focus on maintaining weight loss, and, therefore, may focus more on social support. MENTAL HEALTH/ILLNESS SUPPORT GROUPS. These groups usually focus on specific disorders, such as bipolar or eating disorders. Members of these support groups are often at different phases in dealing with their illnesses, and, therefore, the needs and contributions of individual members may vary greatly from meeting to meeting. Most support groups are facilitated by lay persons, and usually have a set meeting time (generally weekly or monthly), and an open format. The open format allows members to feel some degree of anonymity, and to participate as they are comfortable. For some people, simply attending meetings and listening to the experiences of others can be helpful. FAMILY SUPPORT GROUPS. Family support groups, such as CHADD for parents of children with ADD, or NAMI for families with members who struggle with any type of mental illness, provide support from other parents and children who may be feeling the same level of frustration and exasperation. Meeting others who truly understand one's experience has a very powerful effect. For many parents, participation in a support group is the first opportunity to learn that there are other parents who are experiencing the same challenges and frustrations. LIFE TRANSITIONS GROUPS. Life transitions groups include divorce and aging support groups. Support groups for children of divorce also exist in many communities and schools. ADDICTIONS SUPPORT GROUPS. Traditional addiction support groups include Alcoholics Anonymous (AA), Narcotics Anonymous (NA), and Gambler's Anonymous (GA). Many of these groups follow the traditional "12-step" program of working through various aspects of the addiction, and, as such, are more structured than many other types of support groups. Support groups meet in many different locations within a community. Hospitals and medical centers may provide meeting locations for medical support groups. Community mental health centers, inpatient psychiatric programs, and residential treatment centers are common locations for mental health and mental illness-related support groups. Life transition groups are often provided through schools, senior centers, and daycare centers. Bereavement groups and addiction support groups often meet in churches, community meeting rooms of local businesses, and mental health agencies. Support groups are most successful when composed of persons close in age who are experiencing similar life challenges. Support groups are usually led by members of the group, such as the chapter president or another member of the organizing group. Some support groups may be led by paraprofessionals if they are offered as part of an aftercare program associated with a treatment facility. Support groups usually have explicit norms and expectations for member participation, such as respecting members' feelings and opinions, and coming to meetings free from drugs or alcohol. Due to the open nature of most support groups, members typically feel free to miss a session here or there, which is usually not acceptable in a treatment or therapy group. Group experiences can be very powerful in changing behavior and maintaining that change. The support group becomes part of the individual's daily life, and promotes healthy functioning by providing reminders about change and support when he or she is feeling down or is drawn toward old patterns. It also provides opportunities to own one's change by helping others. These factors contribute to the positive prognosis for most who participate in a group experience. However, a person could be harmed by a group experience as well. Much of this risk is dependent on the characteristics of individual members, particularly in support groups that operate without professional guidance. For example, if certain individuals dominate the group with their own agenda, perhaps at the expense of other group members, then the experience may have a negative impact on more vulnerable individuals. Giuseppe, R. and Galimberti, C., eds. Towards cyberpsychology: Mind, cognition and society in the internet age Amsterdam, Netherlands IOS Press, 2001. Kaduson, H.G. and Schaefer, C. E., eds. Short-term play therapy for children. New York: The Guilford Press, 2000. Yalom, I. D. The theory and practice of group psychotherapy. 3rd edition. New York: Basic Books, Inc., 1985. Evans, J., J. Jones, I. Mansell. " Supporting siblings: Evaluation of support groups for brothers and sisters of children with learning disabilities and challenging behavior." Journal of Learning Disabilities 5, no. 1 (Mar 2001): 69-78. Martin, D. J., D. Riopelle, J. Steckart, N. Geshke, and S. Lin. "Support group participation, HIV viral lead and sexual risk behavior " American Journal of Health Behavior 25, no. 6 (Nov-Dec 2001): 513-527. Montazeri, A., and others. " Anxiety and depression in breast cancer patients before and after participation in a cancer support group." Patient Education & Counseling 45, no. 3 (Dec 2001): 195-198. Sansone, R. A. "Patient-to-patient e-mail: Support for clinical practices." Eating Disorders: the Journal of Treatment and Prevention 9, no. 4 (Win 2001): 373-375. Children and Adults with Attention Deficit/Hyperactivity Disorder (CHADD) <www.chadd.org> . National Alliance for the Mentally Ill (NAMI). <www.nami.org> .